The Falmouth Art Center is dedicated to the visual arts, providing educational and exhibition opportunities on a year-round basis. We welcome students of all ages and abilities and all who enjoy and appreciate art. was the Marks House, commonly known as the “Poor House”. 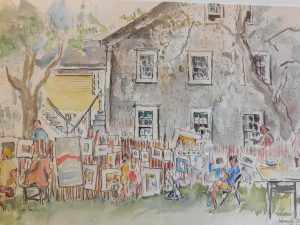 The Falmouth Artists Guild was established in 1966 when a small group of Falmouth painters gathered and began informal art classes. They soon realized that working in a group improved their love of art and their artistic skills. Since their formation the Guild has grown in ways the founders never could have imagined, and today we are the Falmouth Art Center, a tax-exempt, non-profit organization with over 600 members and a full roster of classes, workshops, exhibits, and art sales offered on a year-round basis. The Art Center also collaborates with other community groups on joint artistic events. The Falmouth Art Center and Galleries are located at the corner of Gifford Street and Dillingham Avenue on land donated by Chris Wise of Chatham. Construction began in September 2008 and was completed in May 2009, on time and on budget. The architect was Giampetro and Architects, LLP, and the general contractor was V & V Construction Co., Inc. Landscaping was made possible by individuals and businesses donating their time and materials. Funding for the building was primarily from private individuals and foundations, and with a $240,000 grant from the Massachusetts Cultural Facilities Fund. No debt was incurred in completing the building. The Art Center was designed to accommodate future expansion. The building was officially dedicated in June 2009. Since its opening the Art Center has seen amazing growth in the number of classes offered, students participating, artwork submitted for exhibitions, and number of members enrolled. In January, 2014, the lower level of Art Center was opened providing a new classroom for weaving, children’s classes and printmaking as well as a new state of the art Ceramics Studio, which enabled us to offer classes in hand-building, small sculpture and wheel-thrown pottery for both adults and children. Clay Co-op is also available to members with ceramics experience who are not enrolled in a class. In January, 2016, the upper level of the Art Center was opened. This project added a large studio for workshops and large classes, a third exhibition space, the Sigel Gallery, the Linda and Ron Pointer meeting room, and a fiber studio. This third stage of construction completed the building as originally designed.